Lawrence Technological University (LTU) and the Maua Institute of Technology (IMT) in San Paulo, Brazil, have signed an agreement to bring Brazilian students to LTU to study mechanical engineering for a year. The two private universities, which are similar in size, hope to extend the arrangement to civil engineering, electrical engineering and perhaps mechatronics. Dean of Engineering Marcello Nitz (center) of the Maua Institute of Technology in Brazil met with LTU’s Civil Engineering Chair Edmund Yuen (left) and LTU’s Dean of Engineering Nabil Grace during a recent visit to Lawrence Tech. During the past academic year LTU hosted 18 students from Brazil who have scholarships to study in the United States through the Brazil Scientific Mobility Program. Under the new agreement, if a Brazilian student can’t take advantage of that program, LTU will provide a $10,000 scholarship for one year. LTU and IMT previously had an umbrella agreement to increase cooperation. The new agreement sets in motion plans to develop summer exchange programs at both universities in mechanical engineering and civil engineering, and a shared graduate program in renewable energy. Nitz said his university wants to bring LTU students to Brazil. “We want to see what the needs are [for LTU students] so that we can develop a program that is attractive to them,” he said. 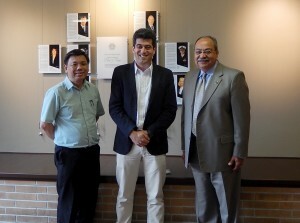 Dean of Engineering Nabil Grace signed the agreement for LTU. “The global economy often requires engineers to cooperate across international borders, so we continue to expand our interaction with universities in other countries,” he said. LTU now has academic exchange agreements with more than 30 universities around the world.